Here's a recording that will make you consider investing in one of the those expensive Super Audio CD (SACD) players. It may even cause you to upgrade your 5.1 surround sound set up or, in my case, finally get one. (Don't ask.) Our friends over at Audio Fidelity, in cooperation with legendary producer and multi-instrumentalist Al Kooper, have put the Mike Bloomfield, Al Kooper, and Stephens Stills Super Session in to the SACD format. This hybrid includes SACD Stereo, SACD Surround Sound, and 2-channel CD stereo. Super Session: Kooper with Bloomfield. And it sounds pretty fandamntastic, even played in stereo through my vintage Advent speakers. But I'm getting ahead of myself. The Super Session, recorded on the fly over a mere two days and released in 1968, was the inspiration of Kooper. Kooper hooked up with blues guitarist Bloomfield whom he respected greatly, and then added Harvey Brooks on bass, Eddie Hoh on drums, and Barry Goldberg for electric piano. Kooper offered piano, organ, vocals, some guitar, and the whole production. Bloomfield was only available for one day, so the songs on what was side one of the LP are with him. 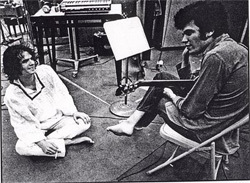 For the second session, Kooper enlisted Stephen Stills, as only he called Kooper back before Randy California and Jerry Garcia could. Ultimately, this quickly contrived round up of musicians went from jam session to super session. Of the songs, on the Bloomfield side three of the five were created by the Bloomfield Kooper team: Albert's Shuffle, a real blues monster, His Holy Modal Majesty, a romp for guitar and organ, and Really, a slow grooving real blues number. A vocal track Man's Temptation, by Curtis Mayfield, is included merging Motown soul with white man's blues. It also includes horns, which were not a part of the original Super Session recordings, but added as an afterthought, as they were elsewhere. For the Stills songs, he and Kooper reached for some current classics. They cover Dylan's It Takes A Lot To Laugh, It Takes A Train To Cry from Highway 51 Revisited in a lively fashion; also the Willy Cobb blues staple You Don't Love Me which has a Sixties psych rock vibe to it; and, finally, a cleverly loose version of Donovan's Season of the With. Needing a final and fourth song they recorded bass player Harvey Brooks' jazz dripping Harvey's Tune, and the horns are back. 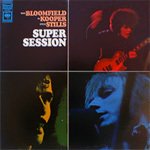 In some sense, Super Session asks you to pick a side: Bloomfield or Stills. But it's not necessary. The former is more traditional blues, the latter second side, something nearly completely different. While I did favor Bloomfield side, the simple fact is that the whole session sounds really terrific. Good songs, good musicianship, and enough improvisation. And, it's also a fine slice of early rock history to boot. If you have that SACD player, put Super Session on your list as must buy. Maybe I need to do some crowd-funding to get my own, and the 5.1 system. If you have that SACD player, put Super Session on your list as must buy as this album sounds terrific, even played in stereo through my vintage Advent speakers.